Choosing a craft during the Middle Ages meant choosing a life. If a young man were lucky enough to enter into an apprenticeship with a good teacher, his future would be secure. About five years ago, valley resident Lee Drake met master jeweler Heyoka Merrifield at the Ketchum Arts Festival. 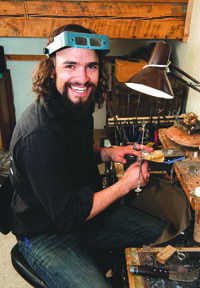 “I had no intention of becoming a jeweler, but I did want to spend time with Heyoka,” said Drake, 30. He went to Merrifield’s home in the Bitterroot Valley in Montana, helping out around the place in exchange for conversation. Drake was encouraged by Merrifield to watch Joseph Campbell videos, about the history of world mythologies. Eventually, he took some lessons at the jewelry bench. “Heyoka gave me a trade, but he also gave me an energy system with which to understand jewelry,” Drake said. Merrifield’s work has been shown at Ochi Gallery in Ketchum. He is renowned for making custom jewelry for celebrities, including musicians Bob Dylan, Joni Mitchell and George Harrison. He studies Native American rituals and incorporates ancient sacred motifs into his designs. Drake grew up in Winter Park, Colo. He graduated from Humboldt State University in Northern California with a teaching degree and worked as a ski instructor and for many years and in the service industry. For seven years, he has lived part time in the Wood River Valley. About three years ago, Drake decided to dedicate his energy full time to making jewelry designs of his own. He said he wanted to create a high “vibrational influence” for his clients. He cuts sheet metal into bands and domes, learning through trial and error how to adapt ancient motifs into his own distinctive designs. He incorporates star sapphire, amethyst and other precious and semi-precious stones. The process of bringing his ideas to fruition has been fraught with challenges. Drake incorporates into his jewelry designs said to be based on “sacred geometry.” They include symbols and patterns borrowed from Hindu temples, Christian cathedrals and other holy sites and structures. He wears a silver and copper bracelet of his own making, cut with the “flower of life” design, an ancient pattern of interlocking and intersecting circles made of flower petals. Although cast in silver, the pattern appears to move back and forth in shifting perspectives, as do the drawings of M.C. Escher. “The flower of life was burned into the temples of ancient Egypt,” said Drake, whose work will show at the Ketchum Arts Festival in July. Drake also continues to sell his jewelry at West Coast “transformation festivals,” including the Symbiosis Gathering, the Beloved Sacred Art & Music Festival and Faerieworlds. He said the life of a traveling artist and craftsman can be “feast or famine” but he is hooked on creating his own designs. “I can’t sleep sometimes wondering how I will set a particular stone. Sometimes I can’t wait to try out an idea,” he said. For more information, go to www.leedrakedesign.com.